You probably are already aware that All Star Automotive is Louisiana’s biggest new Chevrolet, Dodge, Chrysler, Jeep, Ford, Hyundai, Kia, Lincoln, Nissan, Ram, Toyota, Scion, Isuzu and Volvo dealer. However, did you know that All Star is also Louisiana’s largest used car dealer too? If you’re in the market for a certified used vehicle, there’s no doubt that All Star Automotive has exactly what you’re looking for! Shop new and used inventory from All Star Automotive 24-7 by visiting http://www.allstarautomotive.com. We want to make your shopping experience a little easier by also featuring a used vehicle each month in our Vehicle Spotlight segment in the All Star Automotive Blog. 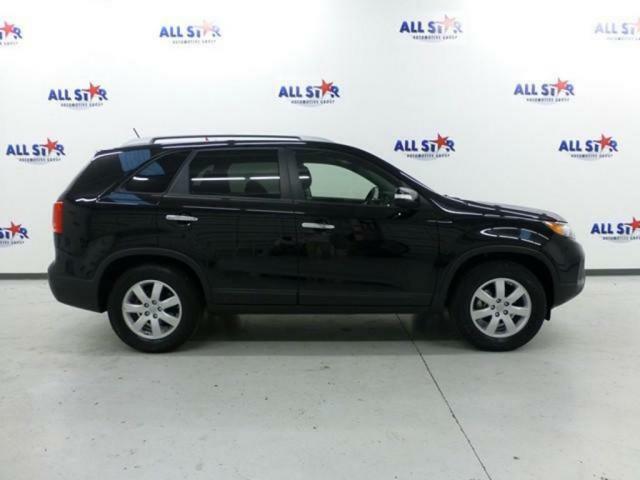 This month’s Spotlight vehicle is a 2013 Kia Sorento that we’re sure you’ll love from All Star Automotive. This Carfax Owner and Kia Certified 2013 Kia Sorento is the LX Trim edition, and features an ebony black exterior and black interior. The 2WD 4dr V6 engine with 276 Horsepower gets 26-MPG Highway and 20-MPG City, which makes driving an SUV a little more affordable. The third row seating in this 2013 Sorento provides plenty of room for those extra passengers, or can be folded down to fit all the cargo you may accumulate on your frequent shopping trips to the mall or grocery store. Entertainment for you and your potential extra passengers is provided by the AM/FM/Sirius Satellite stereo w/CD/MP3 player, which also features an auxiliary input jack and USB port for iPod hookup. Driving and staying connected to the outside world is also made easy through the Bluetooth hands-free link that connects directly to your smart phone. Other key features of this used 2013 Kia Sorento include Remote Keyless Entry, privacy glass, convenient steering wheel controls and safe Electronic Stability Control; but the features don’t stop there. To view a complete detailed list of features on this spotlight vehicle, click here! This entry was posted in Uncategorized and tagged all star automotive, All Star Kia, All Star Sorento, Baton Rouge Kia, Baton Rouge Sorento, Baton Rouge Used Car, kia, Kia Sorento, Louisiana Kia, Louisiana Sorento, Louisiana Used Car, Sorento, Used Car, Used Kia, Used Sorento by All Star. Bookmark the permalink.